Observe plein air painting at Pioneer Museum, 325 West Main Street, or bring your own easel and join in. Free with regular museum admission. Call (830) 997-2835 for more information. Congressman Mike Conaway will discuss the ongoing health care debate with citizens in the area at a town hall meeting at Fredericksburg High School Auditorium on Highway 16 South, September 3 from 8 am to 9 am. Participants will be able to ask questions and participate in the discussion. “I want to encourage everyone in the Fredericksburg area who is interested in discussing the current health care legislation to come out to the town hall meeting,” said Congressman Mike Conaway (TX-11). “It is essential that Congress take the time to get this right to ensure that the doctor/patient relationship is protected, quality is ensured, and our system becomes more cost efficient. I vehemently oppose any plan that puts Washington bureaucrats between patients and the health care that they need and deserve. I stand with the majority of the American people and demand that we propose real solutions to get our economy back on track and reform this wonderful nation’s health care system.” Fredericksburg police will be directing traffic and parking. Photography 414 Gallery, 414 E. Main Street in Fredericksburg, Texas, will host a juried photography exhibit. The gallery will be open for the exhibit Fridays and Saturdays from 1:00 - 5:00pm & Sundays 1:00 - 4:00pm. There will also be an artists' reception on Friday, August 7th from 4:00 - 8:00pm. It is time for dancers to two-step over to the Pioneer Museum, 312 W. San Antonio St., Fredericksburg TX 78624, for the next Roots Music concert, featuring Classic Country and pure Western Swing on Saturday, August 29, in Fredericksburg TX. Jody Nix and the Texas Cowboys bring back the authentic sounds of traditional western swing. Nix’s father was Hoyle Nix, who, with Bob Wills, created and defined western swing in the 1940s and 50s. Nix carries on that mix of pure, traditional western swing and true country music that keeps crowds on the dance floor. Nix surrounds himself with a topnotch band that puts on a high-energy stage show suitable for the entire family. Jody has recorded seven albums and has been inducted into the Western Swing Hall of Fame. Amber Digby is becoming known for reinvigorating the sounds of classic country. Raised in Nashville, Digby sings music in the style of Loretta Lynn, Connie Smith, and Lorrie Morgan. Her two albums have won fans worldwide, and in 2008 Digby was named “Pure Country Female Vocalist” by the Academy of Western Artists. Guests at the Roots concert will enjoy another ample meal from the Longhorn Street Cafe starting at 5 p.m. Just $8 buys two entrees from sausage, brisket, chicken, pork ribs, or pulled pork, accompanied by two sides of pinto beans, potato salad, cole slaw, or green pea salad, topped with a dessert of peach cobbler. Beer, wine, and soft drinks are available. Guests can also take advantage of extended shopping hours in the new museum store. The music begins at 6 p.m., with gates open at 5 p.m. The Pioneer Museum is located at 325 West Main Street in Fredericksburg, with concert entrance on Milam Street. Admission is $12 ($10 with printout from web site - pioneermuseum.net). Students high school age and younger are free. Parking is free. Guests are encouraged to bring lawn chairs. Roots Music is a series of live, open-air eclectic concerts on the grounds of the Pioneer Museum on Main Street in Fredericksburg, Texas. Concerts feature both emerging and established artists in an informal, family setting. The 2009 series finishes on September 26 with Cajun/Zydeco music. Net proceeds support the mission of the Gillespie County Historical Society, a 501(c)(3) nonprofit organization. For information call 830-997-2835. Staff members from the Longhorn Street Cafe serve up hearty plates to hungry fans at the next Roots Music concert at the Pioneer Museum on August 29. Amber Digby and Jody Nix will perform country and western swing. The LBJ State Park in Stonewall and the LBJ National Historical Park in Johnson City will commemorate President Johnson's 101st birthday. There will be a wreath laying ceremony, and an old fashioned birthday party at the Sauer Beckman Farm. There will be an official ribbon cutting for the public opening of the living room, dining room and kitchen in the Texas White House. $1 for tour of the Texas White House. Visitors can also take a tour of the Ranch. This event is free and open to the public. Please call 830/868-7128 x231 more information. The City of Luckenbach wants area guitar players to help break the current Guinness World Record for the largest guitar ensemble--currently held by the Germans with 1803players. On August 23 at 2:00 p.m., with proceeds going to the Voices of a Grateful Nation Project which supports our military veterans, you can join other guitar players in Luckenbach for this Pickin' for the Record challenge to help break that record by participating in one music jam session: Go Texans! This event is sponsored by Voices of a Grateful Nation, Kerrville Folk Festival, Luckenbach and Cheatham Street Warehouse. Register the day of the event. There is a registration fee of $10 per player (6 or 12 string guitars only). The $10 will help cover the cost of the commemorative dog tags and special event t-shirts with your player number. You can also register at www.voicesofagratefulnation.org. That ringing in your ears after the fair parade is the dinner bell for the 1st Annual 4-H Pork BBQ Lunch on Marktplatz from 11 am to 1 pm. Sit down or take it with you, either way, the money raised goes toward scholarships and activities for 4-H clubs in Gillespie County. Cost is $8. Seed art, scherenschnitte and cookie decorating will be offered. Enjoy a lecture and book signing by Mae Durden Nelson from 1:00 - 4:00pm. These events are free with regular admission of $5 per person, and children 12 and under free. Pioneer Museum is at 325 E. Main Street. The wine world will have its eyes turned to Becker Vineyards when San Antonio's New World Wine & Food Festival (NWWFF) heads to Stonewall for the annual Rambling Rosé, with blind wine tastings at noon, 2:00pm and 4:00 of five rosé wines. Light hors d'oeuvres will be served. Cost to attend this event is $20 for advance tickets or $25 at the door. It promises to be a very sophisticated event for wine connoisseurs. Texas Tech Alumni Hill Country Chapter and North Park Lexus will sponsor the Sixth Annual Red Black Golf Classic at Lady Bird Johnson Park & Golf Course, on Highway 16 South. The event includes the tournament, lunch, and after play social. Scramble format is four person teams - all teams and individuals are welcome. Opening ceremonies and shotgun tee/off start begin at 12:30pm and check-in and lunch are at 11:30am. Although this tournament is fun for the players, the real winners are the deserving Hill Country students who receive scholarships from the Hill Country Alumni Association. Also appearing will be the Texas Tech Mask Rider and horse. Please call Sam & Patti Sagebiel at 830/669-2237 or Lynn Hecht at 830/896-1547 for more information on registration. Enjoy works from Fredericksburg Art Guild members. Artists' demonstrations will take place on Saturday afternoons. Please call 830/990-6914 or 830/997-4949 for more information. 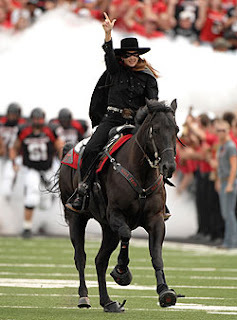 Texas Tech University's legendary Masked Rider and horse will be visiting the new construction site of Hill Country University Center on Highway 290 East for campus tours and photo ops Saturday at 9 am. Bring your cameras and get your picture taken with this Tech icon. Guns Up, Go Tech! Join the Fredericksburg Archery Club for their final monthly shoot of the year. Registration is from 8 am, with a California start from 8 - 10 am. Screw in fill points only. No Open classes. All other classes and rules remain the same. BBQ and Raffle to follow. Adults and Youth $20, Cubs $10, Mini-Cubs $7. Guests welcome! $7 per plate. Call 830-997-2835 for information and directions. Fredericksburg Culinary Arts Presents "The Art of French Cooking"
A salute to Julia Child and the art of French cooking presented by Fbg Culinary Arts at Fischer & Weiser's Das Peach Haus, 1406 Highway 87 South, Saturday August 15, from 3-5 pm. Cost is $49 per person. Please call 512/905-7737 to make a reservation. The eight-time Grammy award winning band Asleep at the Wheel will play in the world famous Luckenbach Dancehall Saturday August 8 at 8 p.m. Cost is $22 per person in advance or $25 at the door. Artisans at Rocky Hill, 234 West Main Street, celebrates First Friday Art Walk Fredericksburg with a trunk show featuring Austin jewelry designer, Cynthia Bloom. Cynthia's creations include hand-blown glass buttons from the Czech Republic along with vintage pieces made in the 1910s and 1920s. The trunk show will open at 12:00 with Cynthia available until 8:00pm to visit with gallery guests about her stunningly beautiful original designs. Wines from Becker Vineyards and cheeses from the Amish Market will be served. Charles Beckendorf Gallery, 105 North Adams, has announced for the first time in 14 years the release of a few small originals, by Charles, for sale. Call (830) 997-5955 for more information.